When I first heard that Bower Books was going to be a TOS Homeschool Crew vendor this year, I confess I had never heard of them. I checked out the website, and I noticed the "Bright Future Series," particularly the title The Person I Marry. Another one that really appealed to me was What Do Heroes Wear? 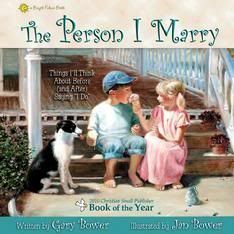 These books are written by Gary Bower and illustrated by Jan Bower. And from the website, the paintings sure looked stunning. Seeing as my youngest two were gearing up to be in a wedding in October, I thought The Person I Marry would be ideal. One thing I want my kids all to understand is the importance of planning a marriage, not just some fancy-schmancy wedding. I was concerned that my 5- and 7-year olds would get caught up in the 'finery and flowery' of this wedding and lose sight of what the whole ceremony is supposed to be about. So when I found out we'd be getting an ebook version of this title... and getting it a couple of weeks before the wedding, I was interested. Very interested. I had visions of putting it onto the iPad and snuggling up to read it with them. "It's 'who', not 'what', that makes a great wedding. don't matter as much as the person you marry." This was a message I definitely wanted my kids to get. And maybe they would have with an actual ebook, almost certainly with the hardcover book. But they weren't enjoying or grasping this in the format we had. I think this book would be fabulous for other little flower girls and ring bearers. And for only $11.99 for a hardcover book, well, if my kids are in another wedding, this is something I'll be looking at then. Disclaimer: As part of the TOS Homeschool Review Crew, I did receive link to view a digital version of this title in exchange for my review of the product. All opinions are my own. For more about my take on reviews, visit my blog post here. I completely agree! The e-book format was a huge letdown. And it didn't leave an impression on my kids. When I asked their opinions for the review (which I still need to write) they all looked puzzled and asked, "What marriage book?" So glad I wasn't the only one. Such a cute book, nonetheless.